Welcome to the Ravnica Allegiance, a set where no matter how many times I type it out, I still have to spellcheck Allegiance. 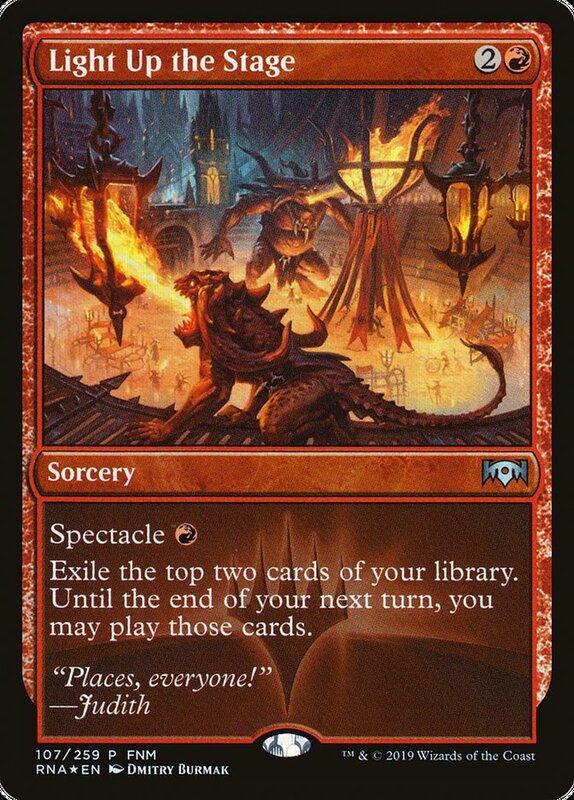 This time around I get to review the Rakdos portion of the set. They’re Ravnica’s own Insane Clown Posse, except with acid and chainsaws instead of Faygo and questions about basic scientific principles. So let’s see what little treats this Magic: the Gathering of the Juggalos has in store for us, shall we? Bedeck // Bedazzle is good fun. Bedeck can kill a pesky 3/3, even one with indestructible, or it can buff something of ours with 4 or more toughness, all at instant speed. Meanwhile, the Bedazzle half glues rhinestones to your jeans. I’m not sure either are particularly relevant in EDH, a format whose ceiling for playability gets higher and higher with each passing set. 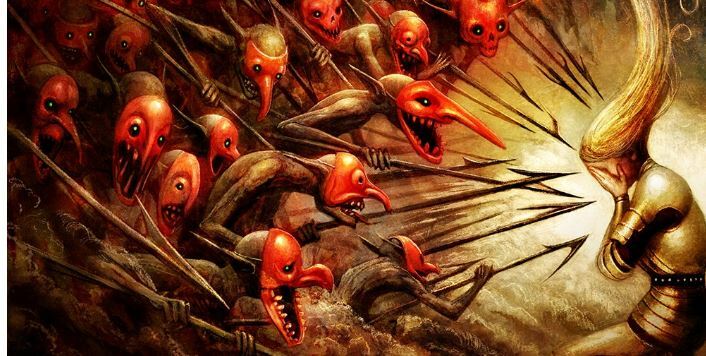 Bedevil has some sick art, courtesy of all-star Seb McKinnon. Nobody can deny that. But is the card itself good enough? The answer is . . . maybe? The competition is real. 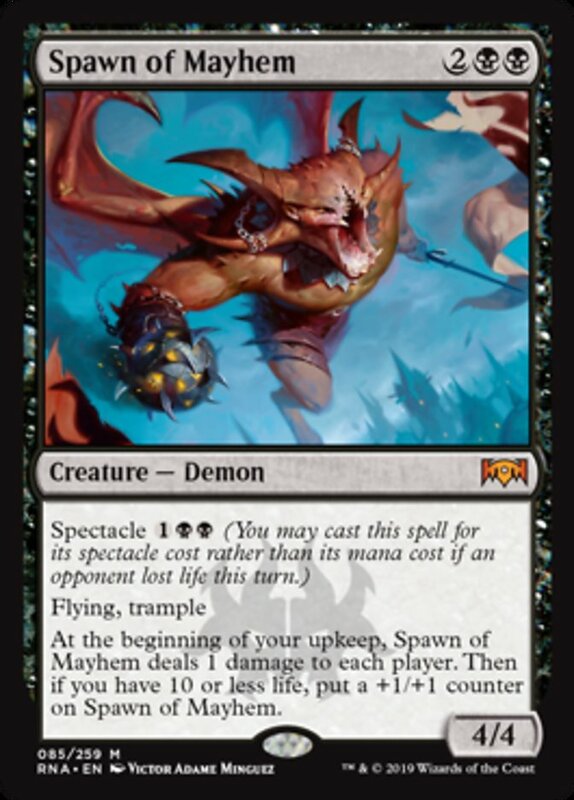 Chaos Warp (28,011 decks), Dreadbore (9,459 decks), and Hero’s Downfall (19,439 decks) already exist as spells that deal with different kids of permanents, and we also have things like Go for the Throat, Terminate and Unlicensed Disintegration for creature removal. Still, the utility of hitting three different card types is hard to deny, as is the versatility of instant speed removal. 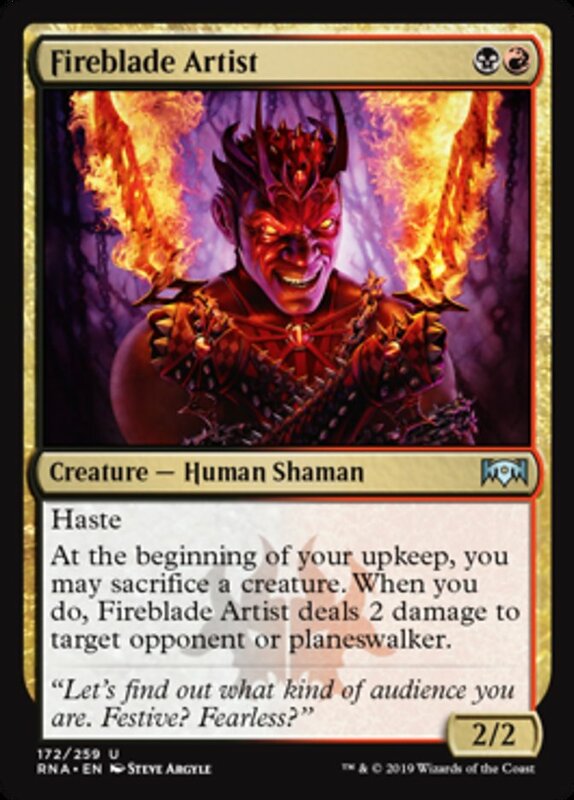 My guess is this winds up replacing Dreadbore in Rakdos or R/B/x decks currently running it, and probably finds a respectable home in a few other lists. Plus: dat art. 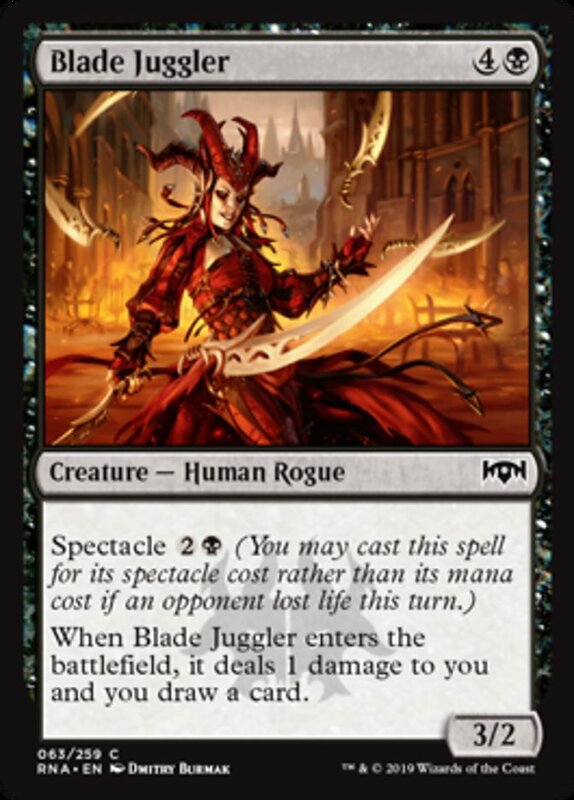 Blade Juggler may find a home in some kind of Sygg, River Cutthroat Rogue tribal list, since the evasion inherent on a lot of Rogues makes casting for the Spectacle cost fairly easy. If you can consistently do that and get some added creature type synergy, then a 3/2 that draws a card for 2B isn’t the worst thing in the world. Outside that narrow space, though, it’s mostly Limited fodder. 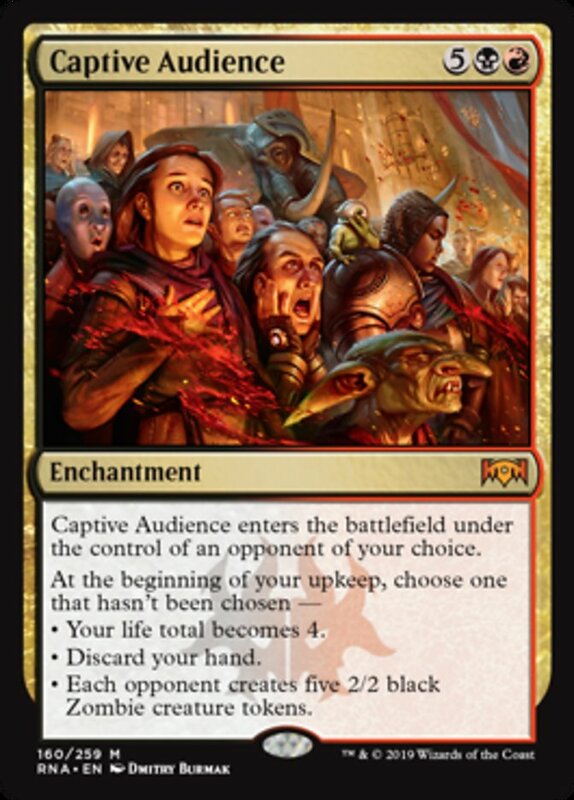 Captive Audience is the spice! Yes, it costs seven, but the opponent you choose has to pick one of three modes that put them precipitously close to an unrecoverable game state. Sure, the Zombie tokens could come back to bite you (ha!) if the other players turn them your direction, but either of the other two modes go off like a bomb, and are extremely hard to bounce back from. Rakdos punisher decks have a new best friend. 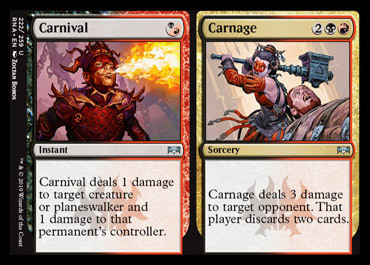 Carnival // Carnage is another unimpressive split card. Sure, the Carnage half is a pseudo-Blightning, but even that only shows up in about 831 decks. I’m not sure a Shower of Sparks on the first half adds any extra sauce, either. Cult Guildmage makes puppet Jace dance! Dance, puppet Jace, dance! That’s the best part about this card. It’s not terrible or anything, but it’s not good either. Neither Human nor Shaman are particularly relevant tribes in black or red, the pinger ability can’t hit bodies, and sorcery speed discard is a fairly weak ability in Commander. All told, this won’t be making many appearances in your local pod. 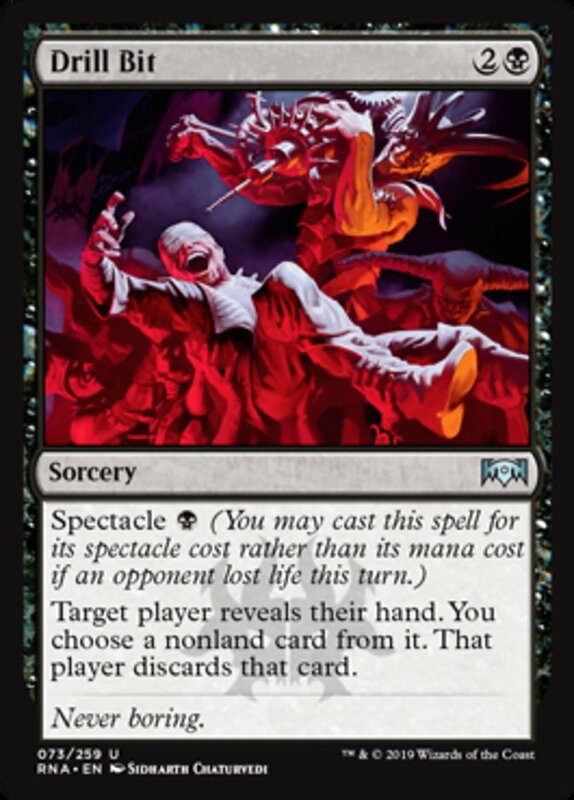 Dead Revels is a strict upgrade if you’re one of the 464 decks playing Dutiful Return or one of the 234 running March of the Returned, but rather than upgrading you’d probably be better off just not playing any of the three. Drill Bit is on point regarding the name, art, and flavor text synergy. Targeted discard just doesn’t usually get it done in EDH, and I don’t think this is the card that will change that. 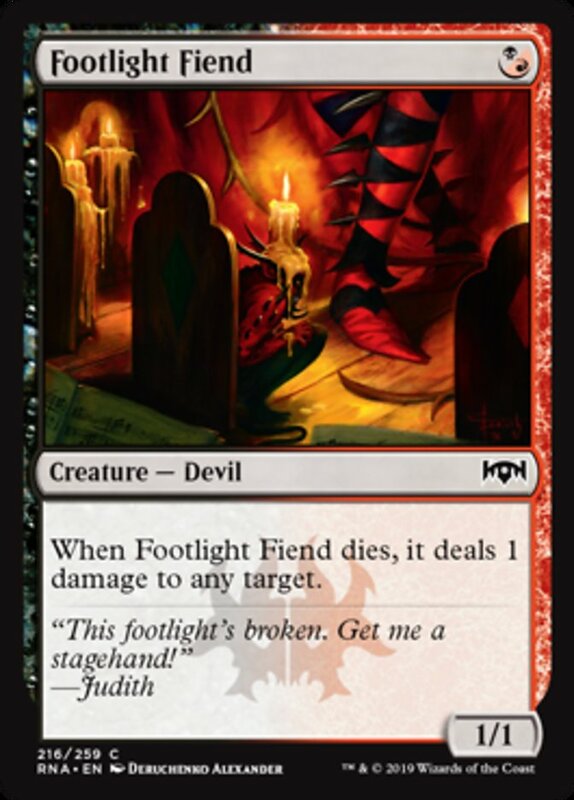 Footlight Fiend is our one hybrid entry to the set. 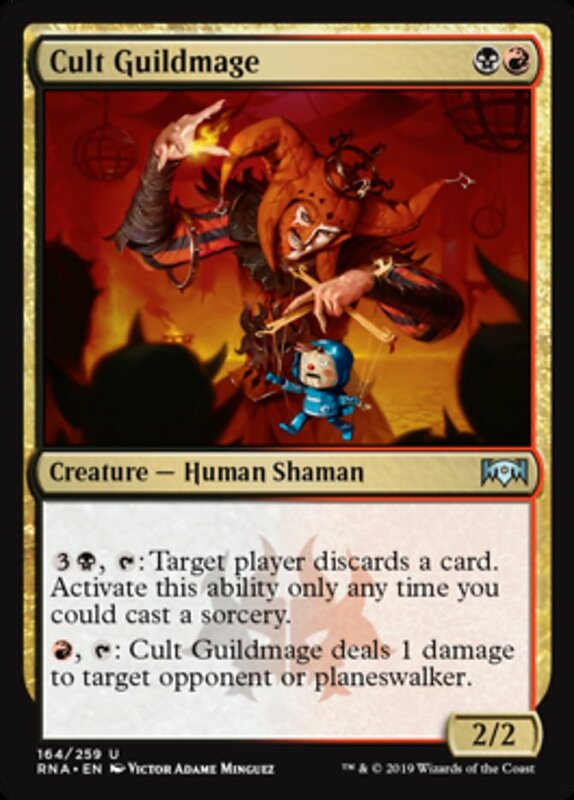 It’s an easy-to-cast 1/1 for 1 that synergizes with new Daddy Rakdos, so that’s something. It’s probably the only thing, but it’s something. Fireblade Artist is a 2/2 hasty body for 2, it’s a sac outlet that doesn’t cost any mana but can only be used during upkeep, and it’s in irrelevant Rakdos tribes. Doming a planeswalker for 2 each upkeep isn’t bad, but is it worth losing a creature to make it happen? Is it worth running this card in the first place to make it happen? Probably not. 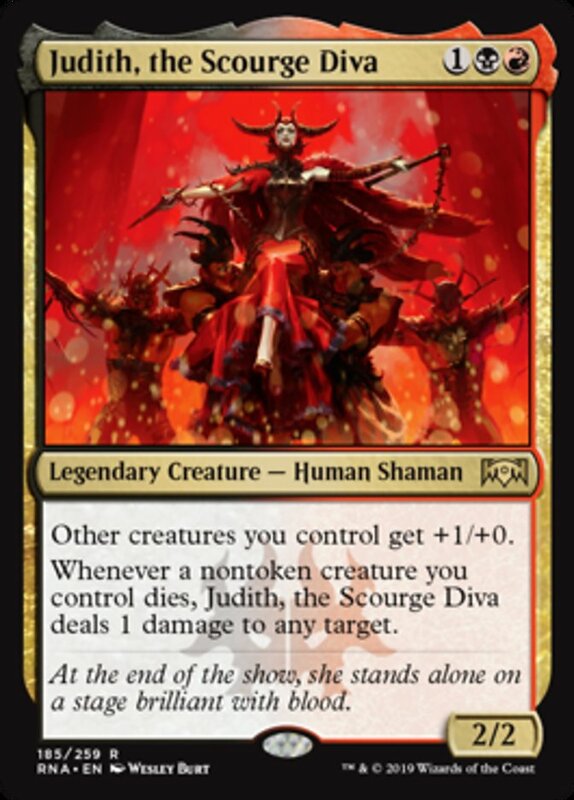 Judith, the Scourge Diva hopefully marks the start of a trend with Magic legends sharing names with members of my grandma’s bridge group. ‘Mildred the Carnival Flayer’ or ‘Estelle of the Bloody Saw’ might be heading our way in War of the Spark. I’m hyped. Until then though, we’ll settle for Judith. It’s always nice seeing a commander cost three mana. She buffs the team’s power, which is always useful. Most importantly, however, is that whenever a nontoken creature you control dies, she deals 1 damage to any target. There’s a lot to unpack there. For starters, you probably need to bring your own sacrifice outlet to really use her correctly. There’s a few attached to lands, like the recently reprinted Phyrexian Tower or High Market, but you’re going to need to devote a handful of slots to things like Ashnod’s Altar, Goblin Bombardment, or Phyrexian Altar to make sure you consistently have one available. There’s also some synergy with Death Pits of Rath and Everlasting Torment as well. Plus, anything that gives her deathtouch makes her extremely deadly. Phyresis ain’t a terrible idea, either. She’ll play a bit similarly to OG Ravnica legend Lyzolda, the Blood Witch, so she’s going to take some work to get the balance right with all the ingredients you need. You’ll probably want ways to repeatedly recur cards from the yard so she always has a slew of flingable pingers. Between recursion, sac outlets, and ways to make her ping damage meaningful, there will be 120 cards you’re trying to pack into a 100 card deck, so you’ve got your work cut out for your ‘death by 1,000 cuts’ deck. Macabre Mockery is a one-time effect to get a body back from an opponent’s graveyard, buff it, then swing and sacrifice at the end step. Decks want sacrifice fodder like Judith might like this, and it plays nicely with Marchesa, the Black Rose, who would return the dead creature to your side of the field. It’s a nice little role player in a few decks. Light Up the Stage works around Experimental Frenzy restrictions and lets you maximize instants by allowing the spells to be cast at any point before your next turn. It also says ‘play’ instead of ‘cast,’ so you can use those cards for your land drop. 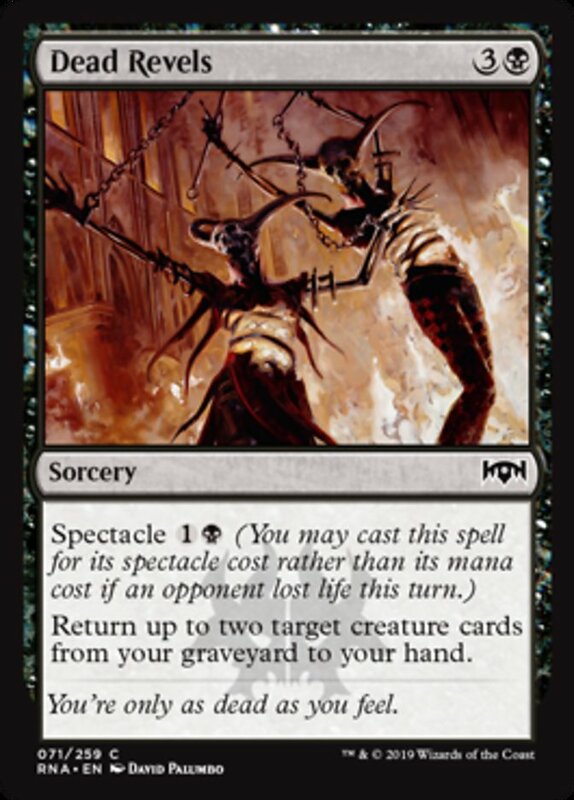 It’s way better if you can cast it for the Spectacle cost, but three mana to get a chance to play two more cards isn’t terrible in mono-red or Boros. All in all, it’s another useful card in a set full of useful little cards. 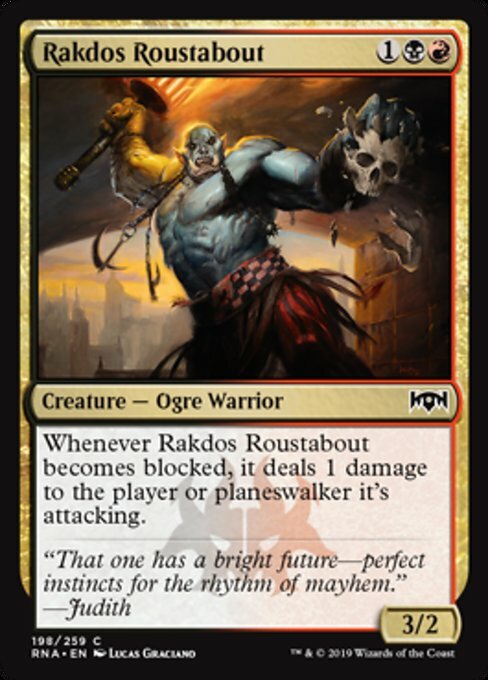 Rakdos Roustabout will always sneak through a little damage, and maybe that’s useful in a deck or two, but I kind of doubt it will see any play other than in those “slapping a deck together from my draft chaff” builds. That’s a coin flip per creature. That’s a lot of coin flips. It’s certainly a unique idea though, and we players don’t have nearly enough cards that care about things like Demons and Devils and Imps, so this is an exciting new addition. Plus Krark’s Thumb gets a little more love, which is always funny. 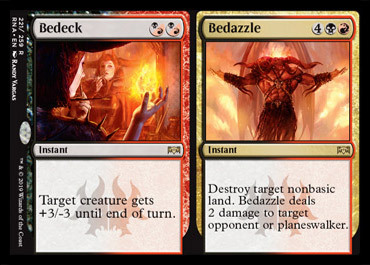 Solid plan for a red-black deck – every time you play your commander (or Conjurer’s Closet him) you’ll destroy approximately half of the battlefield. Hard to say no to that. I’m going to guess a lot of these decks that get built wind up getting taken apart just because they’ll be a lot of work, but I appreciate something so outside-the-box. Make sure you have the patience (and the spare change) to wield the Showstopper. 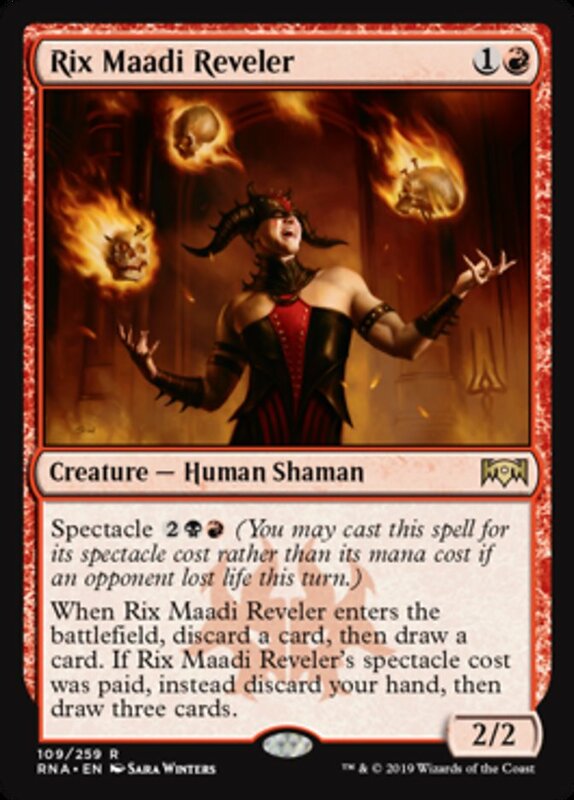 Rix Maadi Reveler will draw you three cards for four mana if you have no cards in hand and pay the Spectacle cost. This is the Magical Christmasland scenario, but even if you have to pitch a few cards, that’s honestly not bad. There’re way worse things than discarding your hand in a lot of Rakdos lists, too – just ask your friendly neighborhood necromancer. 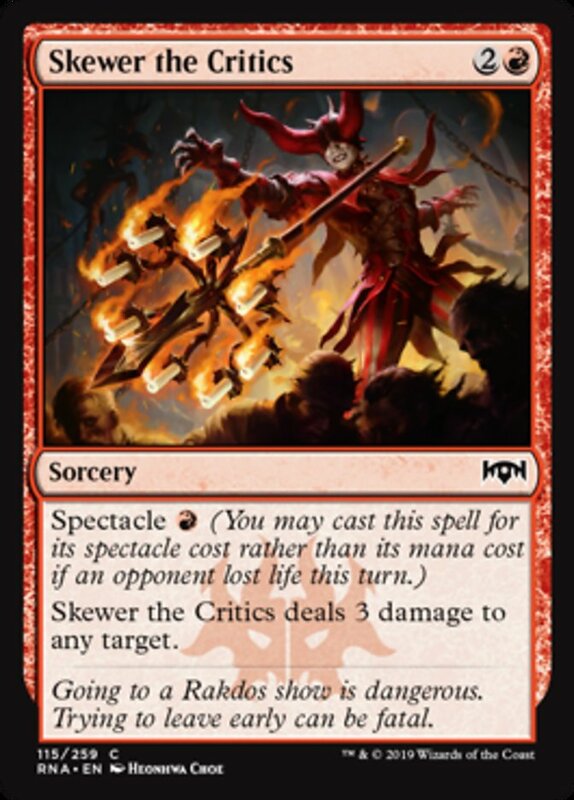 Skewer the Critics turns into a sorcery speed Lightning Bolt if you can cast it for the Spectacle cost. I think other formats like that more than Commander does, where even the instant-speed Bolt doesn’t see a ton of play. Spawn of Mayhem not only has Spectacle, but enables it for your team. That’s really useful in Standard-type formats, but what does it do in EDH? 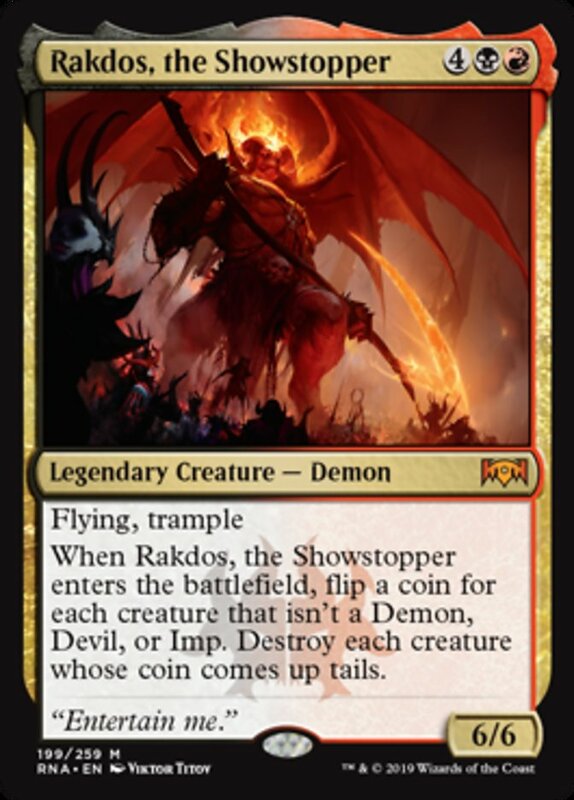 Well for starters, he plays very nicely with Rakdos, Lord of Riots, and doesn’t require a coin flip to survive Rakdos the Showstopper. He can even bring some extra beats in a Mogis, God of Slaughter deck, which occasionally need more creatures in play anyway. This Demony boi isn’t a build-around card, but he’ll also be a convenient upgrade for a handful of decks. That seems to be the EDH theme of this set: low-key useful cards that won’t revolutionize your list, but might shore up some weaknesses. Theater of Horrors is really, really interesting. 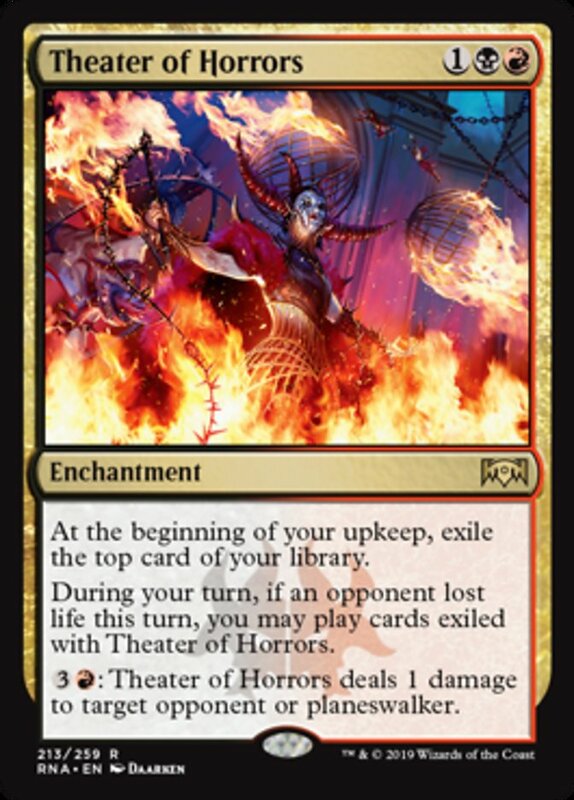 You don’t want too many draw engines that could get removed before they have a chance to actually do anything, and Rakdos colors already have access to Phyrexian Arena. Do you need another? Well, maybe. If you’re running something like Outpost Siege as a second copy of Arena, this might be better. The four mana to ding someone or their walker for a single point of damage isn’t amazing, but it’s not dead either. The exile clause also gets around Experimental Frenzy if you’re running that too. I don’t think it’s a new staple or anything, but it will fill holes in some decks that just need a few more repeatable card advantage effects. 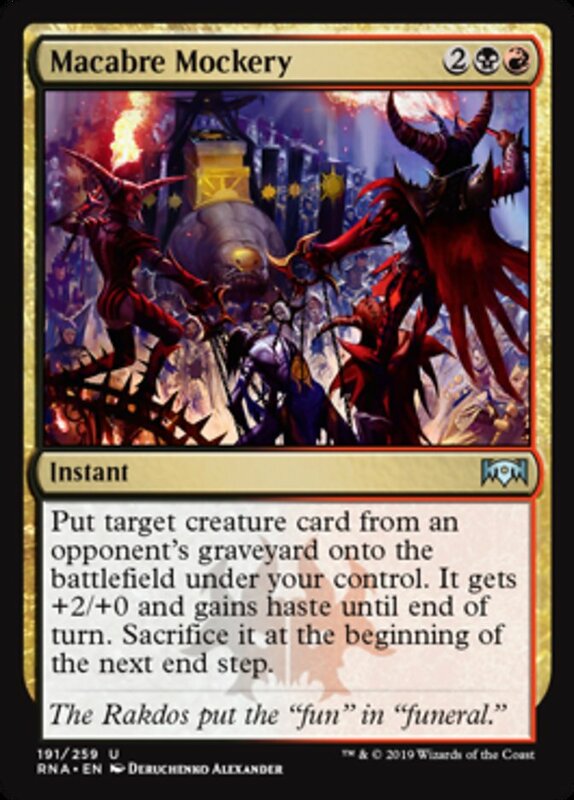 All told, what do I think of the Rakdos portion of this set? I like it. I think there are a lot of role-players here, utility cards you slot into your deck that nudge up the power a little. It’s a miracle! Red gets a few more impulse draw options and we get two very playable commanders. That’s exactly what you want from a set, and I look forward to running a few of these cards in my own builds. How about you? Sound off below and let us know what Juggalos are joining your Dark Carnival.